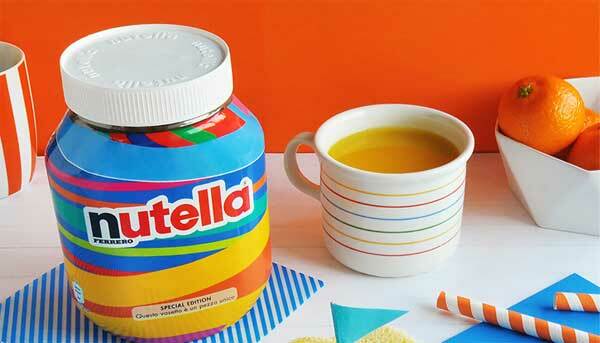 Millions of Italians can now say they own a one-of-a-kind Nutella jar. In February, seven million jars appeared on shelves in Italy, all of them boasting a unique label design. And here’s a weird twist: every single one of those millions of labels was designed by… an algorithm? Yes, algorithm. The word you hardly knew until HBO’s Silicon Valley focused an entire show about the immense power and responsibility that comes with creating one. But instead of compressing files for a made-up startup, this algorithm’s output was millions upon millions of labels for real-life Nutella jars. “An algorithm has usurped the traditional role of a designer,” writes design magazine Dezeen. There are jars with polka dots. Jars with zigzags. Jars with splotchy shapes. All sorts of other patterns, too. Every one of them is eye-catching and colorful. They’d certainly stand out on the shelf at your grocery store. And what was the reason for “hiring” an algorithm to design all the jars exactly? A video about the campaign says Nutella wanted “to make each jar unique and expressive as the Italian people.” That seemed to jibe with Italy’s grocery shoppers. All seven million jars sold out within a month. The campaign was called Nutella Unica and was brought to life by advertising agency Ogilvy & Mather Italia. So the real reason is clear: to create irresistible demand and sell lots and lots of Nutella. This comes as Ferrero, the company that owns Nutella, finds itself defending the use of palm oil as an ingredient. A report from the European Food Safety Authority flagged palm oil as a “potential health concern,” if not processed properly. Nutella’s label has been through many iterations since the ’60s. The most classic one features a white label illustrated with piece of bread slathered with the spread alongside a glass of milk. The Nutella brand name is always in bold, red letters. This campaign kept Nutella logo, but stripped away everything else on the front label. Dots, stripes, squares and various shapes were all fair game when the algorithm went to work. It pulled from dozens of patterns and thousands of color combinations. It’s pretty cool to see the wide variety of labels being slapped on jars in the packaging facility. Due to the sell-out success of these jars, Nutella is reportedly launching the same campaign soon in other European countries, starting with France. It’s always good to create marketing buzz. It’s even better to develop a successful marketing campaign. And that’s just what Ferrero accomplished with its “Unique” campaign of algorithm-designed Nutella jars. It seems like Ferrero hit the proverbial jackpot with this initiative since retailers reportedly had a hard time keeping the whimsical jars in stock. This isn’t the first time a packaged goods company has released uniquely labeled products or used an algorithm to create “fun” packaging art. Coca-Cola’s “Share a Coke Name” campaign, which re-launched in the US earlier this year, has been a wildly popular campaign. It also has created bottle labels that turn into festival wristbands, a clever initiative that resonates with millennials. The wristbands also offer consumers the chance to win access to music festivals. “We know how much people love finding their names on Coca-Cola bottles, so this year we brought back names and added more names than ever,” Even Holod, brand director for Coca-Cola North America, said in a press release. Coke also lets customers create their own customized bottles online. More in line with the Nutella project, the beverage manufacturer previously launched an algorithm-based packaging effort for Diet Coke in Israel. A number of years ago, France-based alcohol maker Pernod Ricard applied an algorithm as well to create unique designs for its Absolut brand. These are just the kinds of packaging innovations that are relatively inexpensive to deploy and a low-risk way to create buzz around a brand — as well as lure new customers. More brand marketers should consider innovative and collectible packaging as a way to make somewhat lackluster products feel new again. It could be just the reason we continue seeing General Mills add the latest and greatest athletes to its collectible Wheaties cereal boxes.